Tibetan Nepali Beads Dazzle You, Learn the Art of Tibetan Om Chants, Hidden Spirituality of the Rosary Prayer Beads in Dharamsala !! 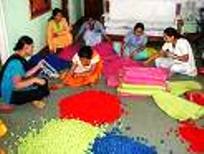 Those who are beads-dazzled, would be eager to find out the history and origin of the beads. Centuries ago it was believed that beads were worn on the armlets to bring 'good luck' to the Hunters. Similarly talismans were as protection against the evil spirits and hidden enemies. 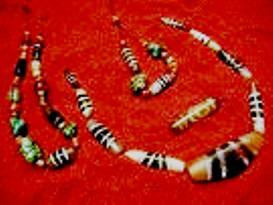 In the ancient tribals societies of the world the beads were used for religious rites leading them to become..holy and sacred for chanting prayers. Scholars agree the concept of prayer beads originated from the Hindu faith, dating back into the 85 century BC..in the cult of 'Shiva'. Sandstone sculptures show hindu saints holding prayer beads known as 'malas'. The names of Hindu God & Goddesses were chanted along with the counting of the beads. 'Shiva' prays on the seeds of the 'Rudraksha tree'. The surface of the seed is rough segmented into five sections. Each section represents a different facet of Lord Shiva while the rough surface is the reflection of the austre life of Yoga & Meditation..the lifestyle of the 'Maha-Deva'! The Himalayan Hindu Kingdom of Nepal exhibits the refined rudraksha malas at the famous Pashupatinath Shiva Temple in Kathmandu. Tibet received Buddhism around 800 AD. Tibetan prayer beads may contain beads of coral,shell,ivory,amber,turquoise and other semi-precious and precious stones. Tibetan rosary contains 108 beads divided by three large beads. The end pieces include the "diore" or thunderbolt and the 'dribu' or bell. 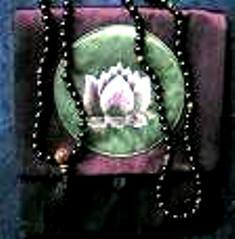 These end beads represent the Buddha, the Doctrine and the Community (Sangha). When Buddhism first evolved around 500 BC, the mother religion being 'Hinduism', the usage of prayer beads became part of the Buddhist meditation and chanting. Buddhism states the origin of rosary as follows.." Shakyamuni the founder of Buddhism..paid a visit to King Vaidunva..Sakya directed him to string 108 seeds of the Bodhi Tree on a string while passing them between his fingers to repeat..'Hail to the Buddha, the Law and the Congregation..", two thousand times a day. While shopping in Dharamsala, you can come across many kinds of Tibetan Nepali beads. Tibetan monks in Dalai lama abode, Dharamsala can be seen chanting mantras with their prayer beads. With a little bit of thought a gift of these beads can be physically uplifting as well as spiritually. According to the stones used or the material which compose the beads, they can be used for enhancing human understanding and faith. Some of the commonly used beads are of turquoise which represent the feeling of unconditional love in one's heart. Amber and Amethyst can cheer you. 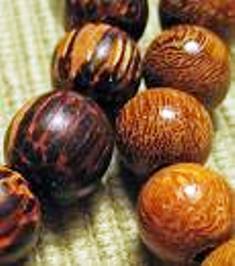 Wooden sandalwood prayer beads emit a healing fragnance which can keep the mind calm and tranquil. In Nepal coloured glass beads are the traditional ornaments of the Nepalese women. The red one also called 'Pote' is generally worn by married women. It comes in all styles and colors for the young decorated with silver or gold pendants. The Tibetan women wear many kinds of beads from semi-precious to precious ones embedded in silver or gold. The most auspiciuos ones are the sacred 'Dzi' beads. This is worn for good luck and good fortunes. For more on Sacred Tibetan Nepali Beads..Go to Dalai Lama Dharma ! !